What does the Holy Spirit do today? Should I ask for Him to give me a particular gift or do a miracle? How can I experience Him on a daily basis? Come to terms with the most misunderstood member of the Trinity. 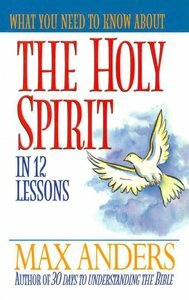 In twelve lessons for individual or small group study, you will watch the Holy Spirit at work from the earliest times to the present, moving through the pages of both the Old and New Testaments. You will get to know Him as your comforter in times of pain, your encourager in moments of defeat, and your teacher in times of confusion. And, finally, you will learn how to receive His power for service to Christ and let His guidance and direction anchor them in the will of God. About "What You Need to Know About the Holy Spirit"
Max Anders (Th.M. Dallas, Th.D. Western Seminary) is the Senior Pastor of Castleview Baptist Church. Dr. Anders is the author of 22 books, including the best-selling 30 Days to Understanding the Bible, and a ten-volume series entitled What You Need to Know About. In addition, he is the original developer and general editor of The Holman New Testament Commentary and has contributed to volumes on 1 Kings, Proverbs, and Galatians to Colossians. A former college professor and adjunct seminary professor, as well as instructor with Walk Thru the Bible Ministries, he is listed in Who's Who in the Midwest.